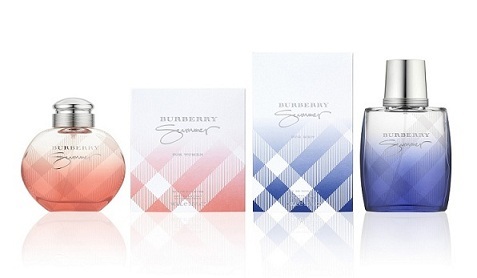 Burberry Summer limited edition fragrances for men and women have been re-interpreted to capture the tranquil mood of a British summer morning. The Burberry Summer women EDT designed by Perfumer Lucas Sieuzac which is a fuity floral green fragrance with the sparkling top notes of pomegranate with orange, mandarin and green leaf. Floral heart notes of rose, freesia and lily of the valley,soft veil of cedar wood, sandal wood and white musk. The men EDT designed by perfumer Emilie Coppermann. The scent is produced from citrus aqueous woody fragrance, yuzu leaves and mandarin top notes. The heart notes with aromatic mint and juniper berries, thyme with warm notes of floated wood and gorse flowers; soft woody dry notes of cedar wood and sandal wood with musks and amber.